Captain's Log Starship 1XE, day 28, Giving Tuesday in the month November, Earth Calendar year 2017. Today is Tuesday. It's a beautiful day in Colorado and I am in my favorite place: my office up at 11,500', eastbound to Meeker where Starship 1XE goes for maintenance. Another 35 hours have 'flown' by and it's time for yet another oil change. With all that's been going on we have flown more hours than in past years. Our flights have been exceptionally productive, but there is more need than ever for the advocacy spurred by our flights. Looking south out my window today I spot the North Fork Valley outside Paonia, one of Colorado's most productive organic farming areas, which is facing renewed threats of oil and gas development. Recently, we filled the plane with reporters over this gorgeous valley to write about these new developments. Everyone's surprise and disenchantment on the plane was palpable with the recent decisions to open up more and more of our western public lands to oil and gas and coal exploration, despite past promises, and facts and figures not making sense. And then after the oil change, it is on to flights this weekend with the Grand Canyon Trust and a collection of reporters over the rim of this most iconic of our National Parks. 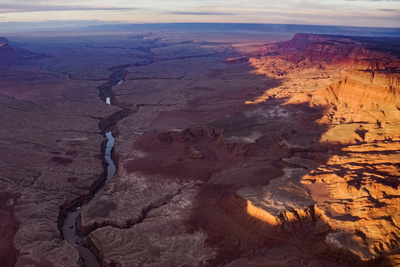 These Arizona flights will be especially important as CBS and other media will be on board to highlight the areas surrounding the Grand Canyon that will be developed, desecrated and decimated if the current administration is successful at removing the ban on uranium mining. But I digress, as it is not just any Tuesday today but it is "Giving Tuesday". Of course, it was just Thanksgiving, and for me it is the season of giving thanks. We at EcoFlight are so grateful for the wonderful financial support we receive from you that enables us to make a difference. And that feeling of gratitude is what empowers us to get up early most mornings and fly into the wild blue wonder and work to help people be aware of the blessing of our environment and the spectacular places we live in and get to visit. Every year at this time I remember my great friend John Denver copiloting in 1XE with that silly grin on his face, being a voice for the environment and enjoying every minute, reaching out to people to help make our planet a better place. 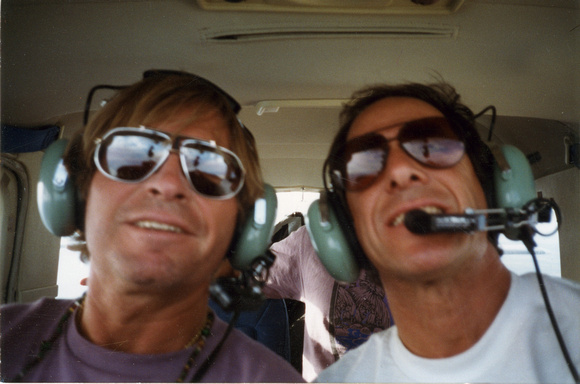 Yes, I have been the face of conservation flying now for well over 30 years, and I am very proud to share that EcoFlight is celebrating its 15th year as your Environmental Airforce. In the next few weeks your inboxes and mail boxes will be filled with appeals from worthy causes and the etheric cyber highways will be sizzling with messages about giving. Our wild places have never been at such risk and it will take a concerted effort by all. On Colorado Gives Day on December 5th, EcoFlight will be joining these efforts with our annual Holiday Video appeal, which will hopefully put a smile on your face! Again, this is the time of year for me for giving thanks. Thanks for your past and hopefully future support. Thanks for the opportunity to make a difference. All of us who care about the land and a healthy and sustainable environment not only give our thanks but encourage you to give to your favorite causes and to make a difference today on Giving Tuesday. Donate to EcoFlight in honor of Giving Tuesday!